That all good dogs (and puppies) find 4-ever homes and live great lives. Watson is an adorable Basset hound mix who's sniffing out his forever home. He'd be great for a family with kids or someone looking for a companion. More about Watson. What is it with cute little dogs running the mean streets of Memphis? Yorkie, Papillon mix, Cindy Lou, is looking for a home to keep her safe. More about Cindy Lou. Zelda is a shy, young Dachshund mix who was found running along the interstate. Help her feel safe! More about Zelda. Fred & Ginger are Terrier, Basset Hound mix siblings who need a foster/permanent home - hopefully as a pair. More about Fred and Ginger. Leo & Pickle are Pekingese who need a foster/permanent home - hopefully as a pair. More about Pickle and Fatso. Layla is a young Schnauzer, Labrador Retriever mix who needs a foster or permanent home. More about Layla. Pesche is a young Poodle looking for a foster/permanent home along with sibling Bear. More about Pesche. Bear is a young Poodle looking for a foster/permanent home along with sibling Pesche. More about Bear. Tucker, the Golden Retriever, Shetland Sheepdog Sheltie mix, is looking for a foster or permanent home. He's young & adorable! More about Tucker. Moving our blog … Please move with us! Janie is a sweet 2-3 yo purebred Cocker Spaniel who is absolutely lovely. When people see her, they ooh and aah and just make over her. Well, others can see her but, rather rapidly, Janie is becoming unable to see her world. In a short period of time after she came into rescue, Janie started having distance problems with her vision and was bumping into things. Not only does she have cataracts in both eyes, but they are rapidly becoming more of a vision deterrent. The veterinary ophthalmologist has diagnosed her with hereditary juvenile cataracts, a somewhat common condition for Cocker Spaniels. Read more about hereditary eye disease in dogs here. The success rate for treatment with surgery is 95%. Janie has a willing foster mom who can comply with the need for post op care. The bill, even with rescue discount, is $2000 for both eyes. Janie is a young dog and the investment of surgery now will have great benefit over her life span. 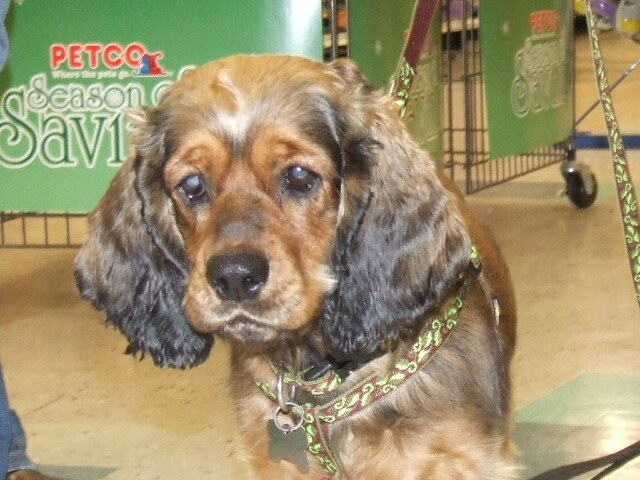 We are seeking donations, large or small, to help defray the costs of giving the gift of sight to this lovely Cocker Spaniel. Come to one of our adoption events and donate in person with cash or a check. Go to our website at http://gdrescue.petfinder.com and donate using the Paypal button. Indicate the donation is for Janie’s fund. Send a check to Good Dog Rescue; 1753 Carruthers Place; Memphis, TN 38112. c/o Janie’s fund. Go to Janie’s fundraising site and donate using Paypal, credit card, or e-check. We will have updates at our adoption events and provide fundraising updates here also. Janie and the volunteers of Good Dog Rescue thank you for anything you’re able to donate to Janie’s cataract surgery fund. Good Dog Rescue’s all a-Twitter! Email us your stories and pics to post! If you've got a story or picture to share about one of the great dogs or puppies of Good Dog Rescue, email the blog's webmistress so we can get your story posted!